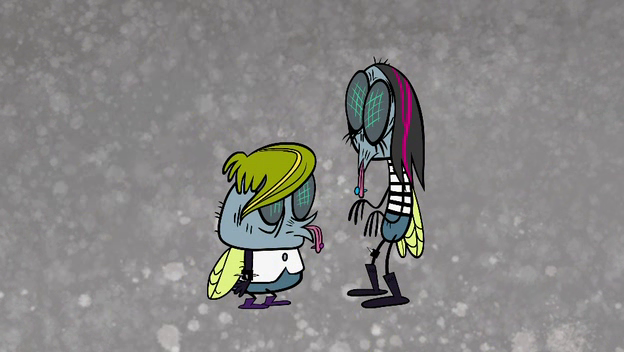 Whatever else it may have been, “Insects” was the single most focused episode of The Ricky Gervais Show thus far. The title is a little bit of a misnomer, although certainly the episode spends a fair amount of time focused on various weird facts (or “facts”) about them. No, it’s an episode that’s entirely devoted to animals straight through, with never more than 30 seconds between two mentions of different animals. Whether these happened to be insects or dogs or dinosaurs, Karl was equally obsessed with them. Weirdly, though, while the show was just obsessed with animals, it was also one of the more fragmented episodes. We jumped from section to section, partially to keep the topic so focused, and so never really got into one of the more truly insane moments of the show. Karl’s special ability… well, perhaps I should say amongst Karl’s special abilities is that the longer he talks, the less likely it is what he says will have any basis in reality. A few episodes back when Karl was regaling us with his film pitches, he explained that if you just let your mouth run for long enough it’s bound to say something eventually, and he’s living proof of this. If you don’t let him really get going, though, it can make the show feel more like a string of strange non sequiturs than anything else. Funny, frequently idiotic non sequiturs, but non sequiturs nonetheless. So while there were some great images and odd ideas in “Insects,” it never really got going with the type of momentum a good episode of The Ricky Gervais Show needs. After a few fairly directionless segments, Ricky began straight-up prompting Karl on the subject of weird animals. Things get off to an interesting start, but we only hear his thoughts on the crab before things move quickly onwards. The actor’s studio-style questions from Stephen were something we’ve seen before, but led to a wonderful admission of Karl’s that his favorite curse is knobhead, the use of which he immediately demonstrates on a hypothetical octopus. He just couldn’t be pulled away from animals. How do they know they’re not dead? But not before they style the hair on their head. I’d rather be a blind moth. In most respects this was the weakest episode of the season so far, but Karl’s poetry brings things up quite a few notches. This is one of the strangest entries Karl ever put into his diary and that’s saying something. Here’s hoping they don’t edit out the other instances of Karl’s poetry, since they never cease to delight. “A dog has got human eyes.” – Wait no, no they don’t. You may notice from his example to aliens that man and woman are, to Karl, different species. “Some new sea thing has been found.” – even for Karl this sentence strains the limits of in-eloquence. Ok, I transcribed one more, just because it was so short: It would be spiteful, to put jellyfish in a trifle.